Description: While visiting a friend, the writer and cleric Thomas Percy (1729-1811) noticed a neglected folio whose pages were being used by the maids to light the fire. Upon inspection, this manuscript was found to be a seventeenth-century collection of historical ballads. Following this discovery, Percy collected further ballads and songs from a number of sources, which he published in this three-volume work in 1765, although ultimately only a quarter of the texts he presented came from that original manuscript. Although this work proved to be incredibly popular, Percy's idiosyncratic editorial practices also received much criticism. 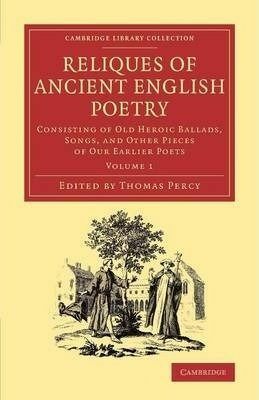 The collection centres on historical ballads and romances, demonstrating the development of language, customs and traditions, to which Percy added contemporary ballads for his readers' enjoyment. Volume 1 contains texts such as 'The Ancient Ballad of Chevy Chase' and 'The Jew's Daughter', as well as ballads which influenced or illuminate the work of Shakespeare.